As I’ve mentioned, people know I sew, so they give me things. They’re always well intended and I do appreciate the donations, but occasionally there is something so terrible that there is no project I am willing to inflict it on. I’d just use all ugly fabric for mock-ups, but it’s not easy to see fitting marks on things with busy patterns. I can’t actually show you one of the most conventionally ugly things in my stash because I got rid of it. I just couldn’t find a project for 4-way stretch sparkly purple and black velvet leopard print poly! It was donated. Someone will love it. It’s so ugly I kind of like it! I have no idea where its from, but it’s modern. It’s called Fritillary Wings, Fairytale Garden for Rowan, Westminster Fibers, by Melissa White. (Sorry Melissa). I know all this because it says so on the selvage. It’s quilting cotton, 44″ wide and I have one yard of it. This other color way was much better. I’ve set it aside to make a new curtain to replace my very 50s (and probably original to the house) curtain, which is damaged. I can’t let something that ugly go to waste! Damaged 50s curtain in an icky loosely woven synthetic. Yes, those are mini skeletons; I have to keep them somewhere. Don’t get me wrong, I do like quilts. OK, I like the single color ones with the loopy quilting stitches, modern Japanese inspired fabric ones and even some Amy Butler ones. Quilts with style, color coordination and forethought are my preference over the homey, random fabric, variety. It seems like everyone is quilting these days, or that every big company selling “sewing goods” thinks the American woman wants to quilt when she wants to sew. Joann’s carries almost exclusively quilting fabrics, ditto Beverly’s. I couldn’t even buy navy double fold bias tape locally recently. Navy! Corsets come in many shapes, from long line, to gusseted, to modern and many variations between. The universal point of corsetry is to shape the body and provide a foundation for the garments, whether that shape is flattened and lifted, the cylindrical shape of a Renaissance corset or the slimming, bulge free, pointy breasted look of a Merry Widow. This image gives you an idea of the variations in just a 20 year period, from 1900 – 1919. Not all corsets are created equal. Not by a long shot. There are some specialized materials and techniques that go into the making of a corset. Most corsets require a busk, which is a particularly shaped front piece that holds that part of the corset flat. There are spoon busks, wooden, horn and split busks with knobs and loops for front opening corsets. The corset will have some kind of boning or stiffening. This can be spring steel bones, plastic, whale bones, reeds, or cording. Some people substitute heavy-duty zip ties with the end parts removed. Farthingales is one of the most complete sources for corset making supplies. When I look at corsets people have for sale one of the first things I look at is the fabric. A corset that is meant to actually alter your shape and survive the strain will be made with at least one layer of coutil. Coutil is a dense herringbone weave fabric. The directions of the weave do not stretch and this is key to a corset that alters your shape without its own shape being altered over time. No, denim or duck won’t do; they are plainweave and will stretch. It’s not the thickness of the fabric you are after, it’s the weave. Would some other herringbone that is not strictly coutil work? Possibly. That could be something to explore. If the corset is to be pretty it will usually have a layer of fashion fabric over the coutil. A corset may also be lined with a third fabric, but only the coutil is strictly necessary. Coutil is expensive. A look at Farthingales today shows that it can be in the $45/yard range. I’ve purchased their coutil and know they sell excellent quality. Recently I found a non-pre-shrunk coutil elsewhere and have decided to give it a try as the prices was very attractive. 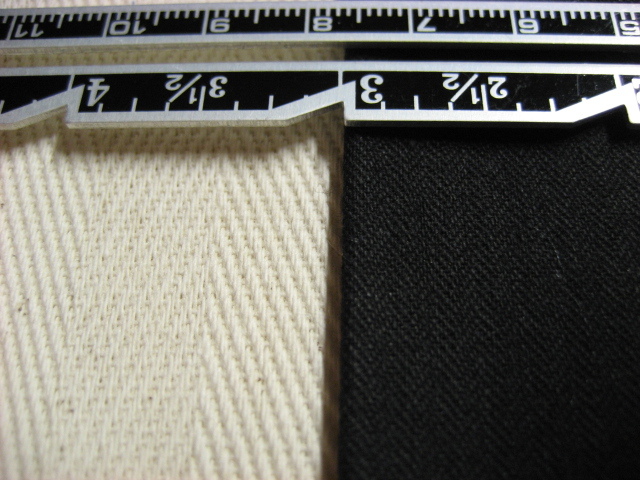 Below you will find the inexpensive sample on the left and the excellent Farthingales stock on the right. Notice the difference? The herringbone weave on the right is much smaller. The one of the left almost looks like it has alternating stripes of denser and less dense weave. I’m not entirely sure how the one on the left will perform. That said, it may perform marvelously. After pre-washing it, where it will lose roughly 5% of its size (which means the weave will be tightened), I’ll have to see how it fares. I am planning to make either a waist cincher or (my approximation of an) Elizabethan corset with this.